Growing up in a vegetarian Indian home meant that there was no meaty piéce de resistance like a standing rib roast when we entertained. If my mom wanted to step it up a notch, she would serve vegetables whole. The two examples that come to mind immediately for me are her whole roasted cauliflower that she would cook slowly in a tomato based sauce and baby potatoes. She would have to buy the potatoes canned (fresh fingerlings were not yet a thing) and she would cut them open, stuff them, and then tie them back together with thread so they looked whole again. I would watch her do this painstaking process wondering if all the work was to improve the appearance or the taste of the dish? Either way, these experiences left a healthy dose of respect in me for whole vegetables of any kind. Serving veg whole = more impressive dish. And it so happens that serving whole vegetables is undergoing a bit of a renaissance. You’ve probably stumbled across at least one article in the past year for cauliflower steaks, am I right? Not exactly a whole vegetable but definitely in the same vein. So it came as no surprise that one of my recent Food and Wine issues had a recipe for whole roasted cauliflower. In the magazine, the cauliflower had a Mediterranean bent and was served with a tahini sauce. It immediately got me thinking of my mother’s cauliflower dish. But I wanted to make it easier to prepare with still the same punch of flavor. My solution was to brush the cauliflower with a thin coat of oil and then coat it in Indian spices. The prep is well under 10 minutes if you have all the spices on hand. It goes in the oven for about an hour and emerges just gloriously burnished and impressive. Perfect for a party. In fact, I had it as part of a holiday spread and just put a small knife on the side so folks could cut off florets as they wished. My guests went gaga for it. Easy to prepare but big on flavor and presentation make this recipe one that is quickly becoming a favorite in my kitchen. On my last preparation, I used the gorgeous Romanesco which was divine and is what is pictured. It would also be quite breathtaking with the stunning purple and orange cauliflower I have seen popping up at the grocery store. Cauliflower suddenly feels so fancy and this recipes only amplifies that quality. A quick note on ingredients – garam masala can be made quickly at home – recipe lives here. And aamchur or dried mango powder can be found at your local Indian market or online. Sumac would be a fine substitute or even a generous spritz of lemon after the cauliflower is baked. 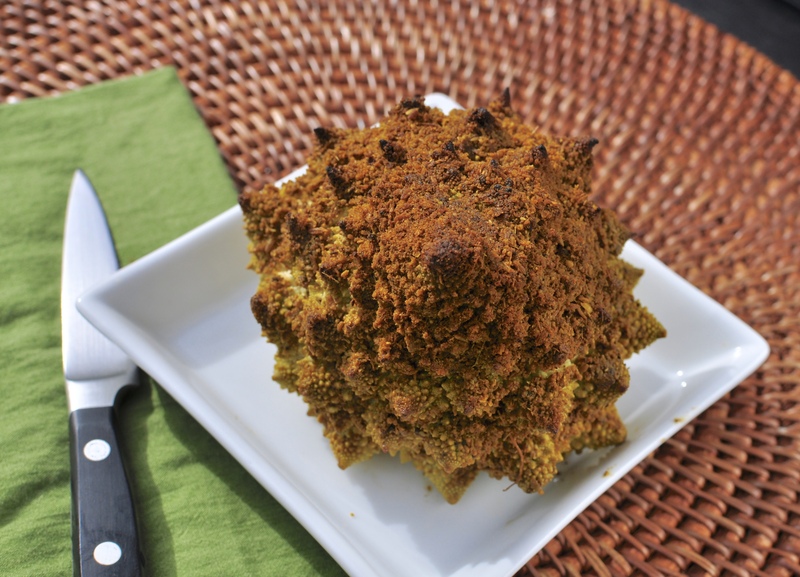 Whole cauliflower is covered in spice and roasted for an easy yet impressive dish. Whole30 compliant. Mix together all the spice mix ingredients. Set the cauliflower in a 9x13 baking dish and brush with oil. Then sprinkle on the spice mix. You want every inch to be covered with spice so don't be afraid to cake it on! Some will inevitably fall off during baking anyway. Add 1 1/2 c water to the dish. Roast the cauliflower for an hour until it is tender and browned. Serve the cauliflower whole or cut into slabs. Love it that you used Romanesco! I’m going to try this with my next cauliflower or Romanesco from my Riverdog Farm CSA.